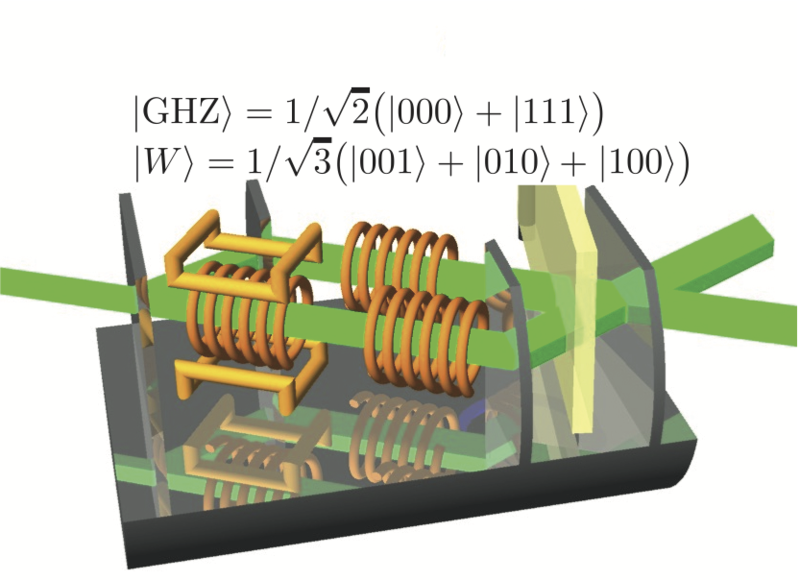 A Greenberger–Horne–Zeilinger (GHZ) state 1 is a maximally entangled quantum state, which involves at least three subsystems. They are either represented by individual particles, as it is the case for photons, or degrees of freedom for single particle systems, like neutrons. GHZ states can be applied to prove the GHZ theorem as a way to disprove the concept of “elements of reality”, introduced by Einstein—Podolsky—Rosen in their attempt to prove that quantum theory is incomplete. The GHZ theorem is a significant improvement over Bell’s Theorem in a sense that it gives the opposite prediction — and not only a statistical violation like Bell’s Theorem — when compared with realistic theories (see here for details on the GHZ argument). Measurement results of four expectation values were inserted in an equality, derived by Mermin, yielding a final value of , which is significantly larger than 2, the upper border of realistic theories. The expectation values are obtained by inducing relative phases between the orthogonal eigenstates of the individual quits, i.e., spin, path and total energy 4. Note that the energy subspace, in general, does not consist of only two discrete levels (that are addressed here) but has a continuous structure. Our results clearly contradicts the noncontextual (realistic) assumption and confirms the predictions of quantum mechanics as a contextual theory. In so doing, we want to express that the use of entanglement of the energy degree of freedom is not limited to neutrons but is easily applicable to other quantum systems (atoms, ions a.s.o.). Furthermore, a coherent manipulation of the energy degree of freedom can be extended to create artificial multilevel quantum systems (e.g., of the order of ) in a single-particle system by applying a multiple-frequency energy-manipulation. In a neutron optical experiment without involving a spatial beam separation, where entanglement of spin, momentum and total energy degree of freedom is generated utilizing a suitable combination of radio-frequency and static magnetic fields 5. Genuine tripartite entanglement of these states were analysed by proper nonlinear witnesses. A full tomography of the generated states would have been too complex and partly even infeasible (because certain coherences cannot be achieved). As entanglement witnesses do not require a full state tomography they clearly provide an advantage in this case. It is demonstrated that, only by measuring few matrix elements, different types of multipartite entanglement can be proven to be present in a single-neutron system. Our results show that quantum correlations can indeed manifest in different subsystems of a single physical entity. Interferometric setup for preparation of a GHZ, as well as W-states. Our revealed substructure of an entangled single-neutron system and high controllability opens the possibility for testing more fundamental and sophisticated properties of neutrons via exploring just this substructure.